Very pleased with this purchase. A vibrant teal blue, the cushions are perfect for my rattan rockers. Sufficiently padded, and comfortable to sit on. I would highly recommend! Tie this cushion to your swivel rocker chair to enhance your seating experience. Blown polyester fill and cotton construction elevate your comfort level, and tufted detailing adds a hint of style. it is beautiful and soft but forgot to buy the chair. 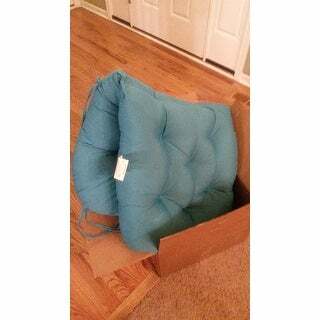 I am very pleasantly surprised with Blazing Needles Solid 48 inch Swivel Rocker Cushion 48 . The most helpful feature for me, is great quality, good product and service. Definitely recommend one! The cushion is well made and color is vibrant! Just as expected! Nice solid rocker. Very comfortable as well! I wish I could give less stars. When they advertised this item, they must have counted on people not having thier glasses on to read the very last work in the 5+ word item description. The key word in this item is "cushion", that's all this item is. It is a just a cushion for the awesome chair you see in the picture. Talk about a FAIL. We got this item for our daughter, she was so excited. Imagine our faces when we opened the package delivered to find...a cushion - no chair, just a cushion...yep. FAIL! And after Googling the chair in the picture, it is a couple hundred dollars to get the chair, thus the reason you won't find it here or on ***. So, guess what I will be returning to Overstock? It didn't even come wrapped in plastic, just came in a box, so we're probably not the first to just turn around and return it. Would anyone else like a chair for thier cushion? Good luck. Negative 5 Stars on this purchase! To be fair, it was a nice cushion. But that is all there is. A cushion. If only it came with the chair, then it would turn the negative stars into positive ones. This item can be potentially decieving for people who see the picture of a chair, start to read the item description, and either stop or skim, filling in blanks, assuming that it is a nice chair for a good deal. The title is long after all- people tend to due these things. The title, along with the picture could be misleading. A potential scam, relying on human error for cash. Who knows, maybe the person setting it up didn't realize it could cause problems, which is possible. It could even be the customers' fault for not double checking or being more thorough. I would also like to mention again that the cusion is not wrapped in plastic, which is a slightly less pressing issue, but still one all the same. If it (the chair cushion) is NOT what you are looking for or expecting- which might be the case for maybe 4/5 of you- prepare for disappointment. Unless of course you want to pay approximately $250 for the real chair, which a few of you might. Most of you probably already did I realize. But hey- if you really did want the cushion, be my guest. This review is not about the quality of the cushion, it is a cautioning review about decieving customers. Just one last word of advice: Be careful and thorough. A little research might be of some use too. (Edit: I now realize that the reviews and description acknowledge that it is a cushion, and that was a mistake on our part. I apologize. It seems like a really good cushion.) Don't, however, let this review stop anyone from purchasing products from Overstock. [There is an attached picture of said cushion mentioned in the above review.] Thank you for taking the time to read this review. We hope that it may prove to be helpful. Excellent buy! Cushion is the exact size for the swivel rocker, make from quality material and true to color. Comfortable and well made. Recommended. This product came from overstock just as explained. The description was painted beautifully as I opened the package to see it resembled just as read. The product has showed no signs of defects to this point in time, and hoping that it continues to uphold it’s integrity. Best price by far anywhere. Perfect fit. Perfect color and extremely comfortable. Thank you!! I was happy with the quality and the color. THE COLOR AND FIT WERE PERFECT. TOOK A BIT TO GET HERE, BUT OTHER THAN THAT WOULD PURCHASE AGAIN. It looks very pretty, looks nicely made, but when I sat on it, there's nothing, you feel the bottom of the chair, the inside material squoozes to nothingness. Very disappointed. But it looks good anyway. Love colors vibrant and stays new looking. I would highly recommend this cushion. Thick, sturdy and very soft! Unfortunately oversized and way too puffy to be comfortable- When I sit on this cushion I feel like it is pushing me off the chair in a bouncy way. I want to snuggle into my cushion and not to feel like a rejected bouncy ball. It is unfortunate that it is so, because the color and fabric look fantastic. Ultimately you don't own a chair just for it to look nice- it needs to be something you desire to sit in. I really love the size and how very comfortable it is. Looks like a brand new chair. Heavy duty fabric. "is this suitable for outdoors"
Definitely.. I leave my cushion out year round in New York climate and it’s still vibrant blue color. I do have it under an awning though. "How do u get the frame of the chair? 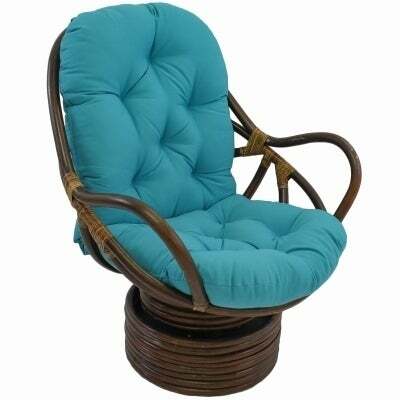 It says cushion only on all the Blazing Needles Twill Swivel Rockers"
It is an international caravan rattan swivel chair and available on Overstock. "What is the seat height of this chair?" "I want to put this cushion on a screened in porch. The porch is covered so it won't be rained on directly, but it will be outside. Will this be okay, or do I need to look for another that specifies outdoor use? Thanks!" These cushions are made very well. I use mine on my deck with a roof overhead and they are subjected to the weather, however they have held up very well. They're comfortable and they look good.. You really should be fine with the screened in porch. "My chair looks like this but is a java swivel. I found the chair with cushion online but not the cushion separately. When I looked at the details I believe it was the cushion it gave the following measurement....H - 39.0; D 33.0; W 28.0. Do you believe your cushion would fit my Java swivel chair?" yes, the cushion fits perfectly in my chair which is a Java Swivel chair as well. "Is this cushion filled with foam or just fiber? We have one filled with fiber and you feel the wood frame in the seat. Very uncomfortable." The cushion has blown polyester fill. "Is the red a bright color or closer to a burgundy?" The cushion is a ruby red. I hope this helps. I ordered two and could feel wood frame. Would not recommend.